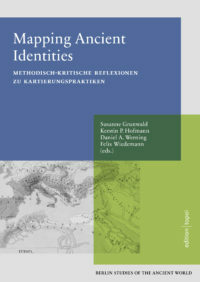 The (re-)construction and the spatial allocation of collective identities is a central component in ancient studies. Though maps play an important role as an analytical tool and as a presentation method, their implications and effects have, thus far, been investigated and compared insufficiently. The study of ancient history has not only tried to present geographical information about the origin and distribution of languages, artefacts, people, and cultures in a narrative way, but also to fix them on maps. Such cartographical constructions of identity can be understood as a direct, or an indexed, understanding of historical actors. There are maps in which people or language groups are immediately situated geographically, whereas others only show the geographical distributions (linguistic features, material objects, etc.) that are considered indicative of the presence of collective identities, or acts of collective identity. In this volume, mapping practices from different academic perspectives will be critically examined in their different manifestations and transformations.